I really enjoy every cruise that I take and consider them an excellent vacation from "the real world." However, people often ask me to compare different cruise lines and ships, and I often find myself at a bit of a loss because I have wonderful memories from all of them. Therefore, I have decided to begin evaluating and 'ranking' the cruises that I take based on ten components of a cruise vacation which are important to me - itinerary, ship novelties, pools, activities, entertainment, dining, bars+lounges, service, design+aesthetics, and cabin. 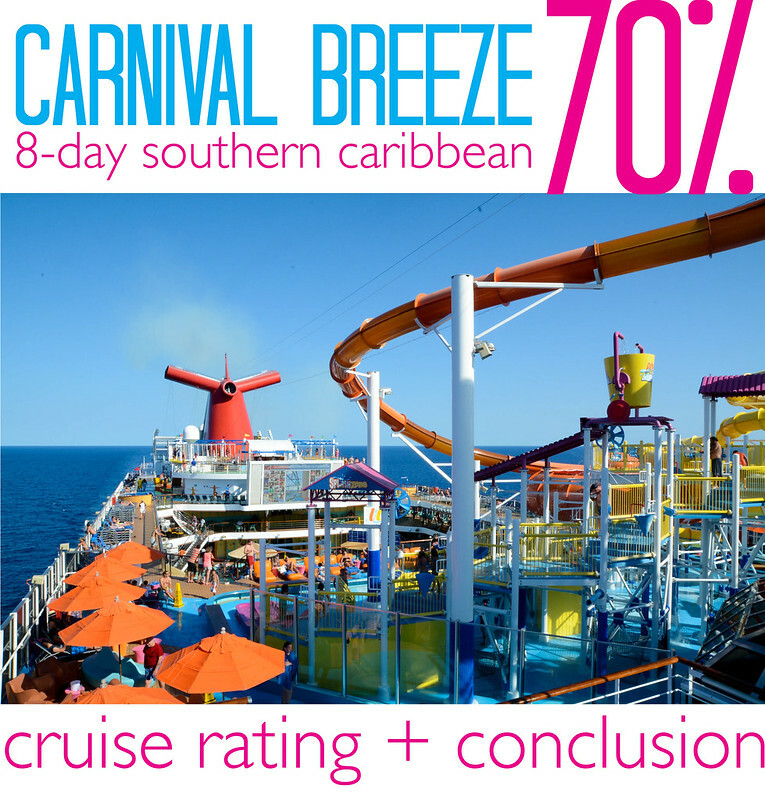 I have ranked the Carnival Breeze 8-Day Southern Caribbean cruise taken on March 15, 2014 on a scale of 1-10 (10 being the highest possible ranking) in all ten categories to come to an overall percentage or cruise rating. Please note that these rankings are completely based on my own opinions, experience, and personal bias. 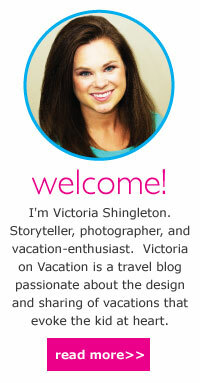 I am in no way affiliated with any cruise line. I also understand that every person on each ship sailing has a completely different experience, as well as values for what makes a good cruise vacation. What really sold me on this cruise was the itinerary. I’ve been on so many Caribbean cruises now that I’ve repeated ports three or four times, so I’m always excited to go to a port I’ve never visited before. 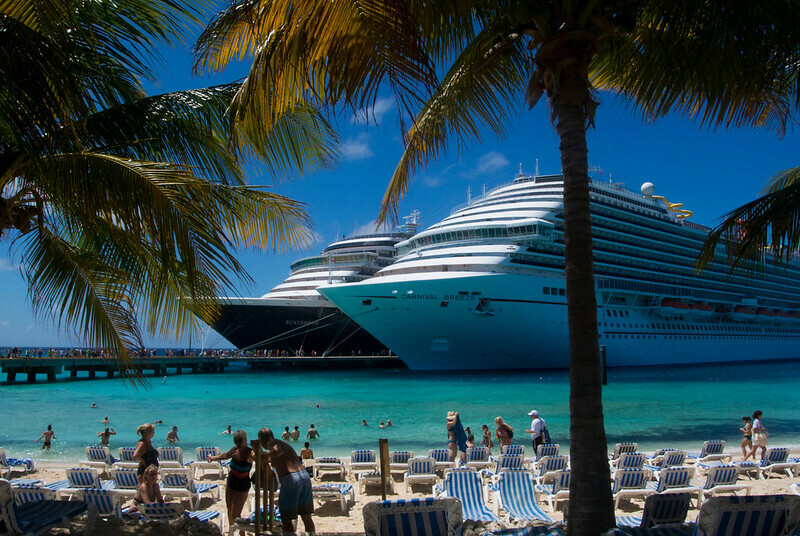 On this cruise, I had never before visited Grand Turk, Dominican Republic, or Curacao – three out of the four ports! I would have preferred to maybe have a fifth port and one less sea day, but besides that I really enjoyed the itinerary. Grand Turk: We were in this port for the shortest amount of time. We booked the certified scuba diving excursion through Carnival (Oasis Divers) because we wanted to dive on this trip, and we found Grand Turk to be the best port for that (3rd largest barrier reef in the world). We really enjoyed the scuba diving excursion and are glad that we booked it. If we didn't book a dive excursion, we probably would have just hung out at Margaritaville and the beach at port since we were in port for such a short time. 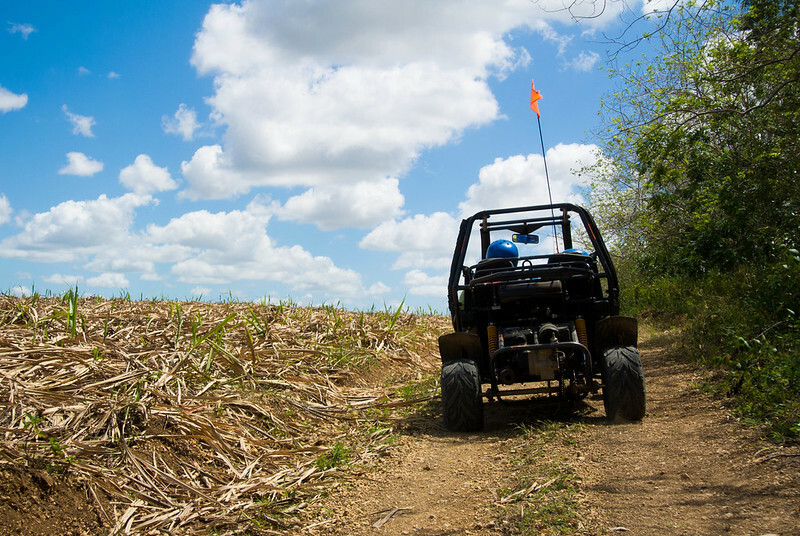 La Romana, Dominican Republic: For La Romana, we booked the dune buggy excursion through Carnival which we also really enjoyed. We purchased the bandannas sold at the beginning of the tour and are extremely glad we did because I do not believe the excursion would have been tolerable without mouth and eye protection, due to all of the dust kicked up from the dirt roads and fields. This excursion was an excellent way to see the island, and the dune buggies were also fun to drive and ride in. Aruba: Aruba was the only port that I had been to before (for a short period of time). The Breeze didn't arrive into port until after 2:00 PM which made getting off the ship a slow process. The rush of people leaving the ship at once also backed up taxi service. Luckily, there were also buses going to the beaches. 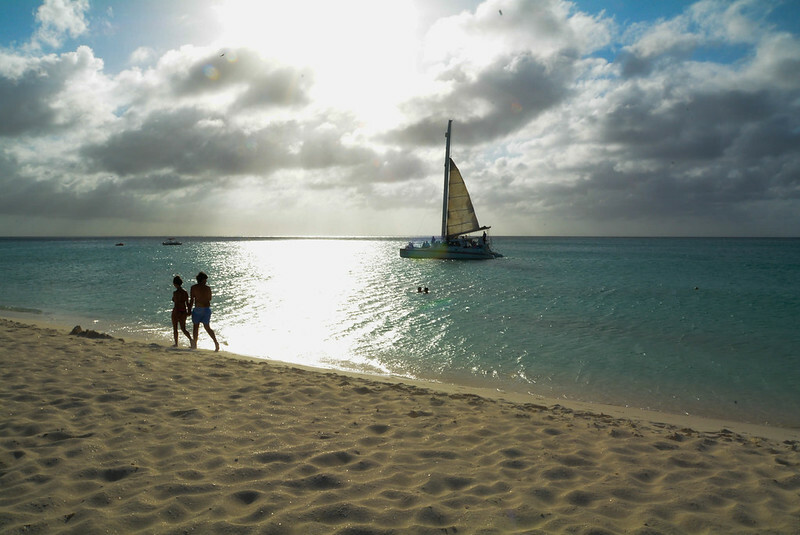 We went to Eagle Beach which I had visited when I was last in Aruba. The beach is vast and lovely. It is possible to rent chairs, but there wasn't any bar service where we were dropped off. 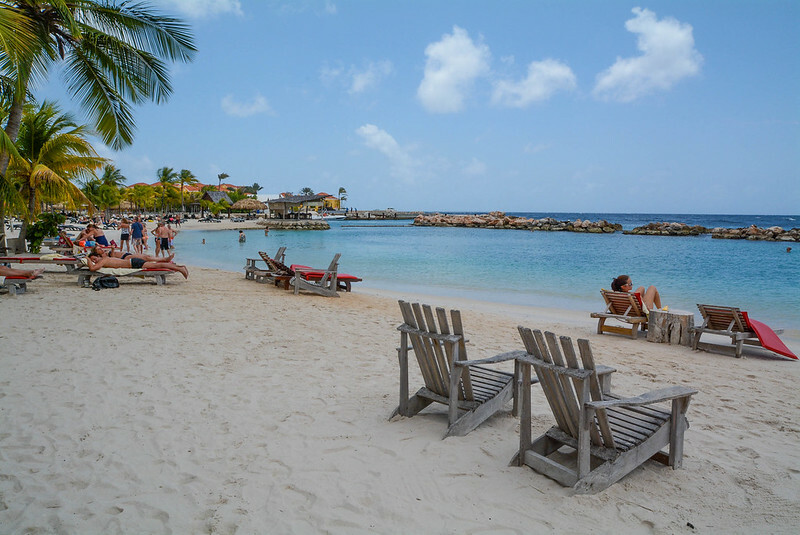 Curacao: We had no plans for Curacao except to find a beach. A van driver took a group of us to Mambo Beach which is a private beach ($3.75 entry fee per person). It is a lovely area with a pool, several bars, and shopping. I find the competition that the cruise lines seem to be in to add the latest “gimmick” to be quite humorous and entertaining (first flow rider at sea, first zipline at sea, first bumper cars at sea… will it ever end?). 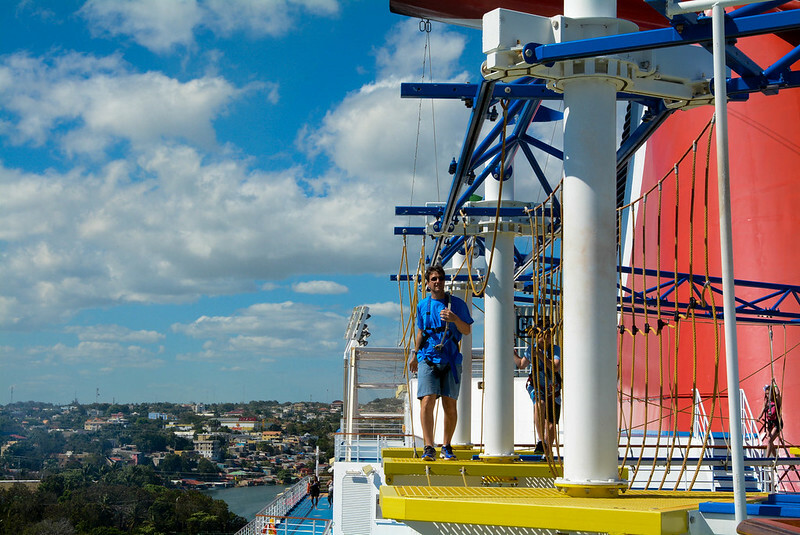 The Carnival Breeze has a ropes course on the sports deck. We did it once, and it was more challenging than we thought it would be, but not exactly thrilling. There were, however, many kids who seemed to really enjoy it. The Breeze also has a 4-D Thrill Theater which I never went to because the last thing I want when I’m a moving ship is to be shaken around. It’s $7.50 for one show (approximately 20 min) and $14 for an unlimited pass. More typical on a cruise ship, the Breeze had a 9-hole miniature golf course on the sports deck, as well as an outdoor television showing games. There is also an outdoor fitness area with gym machines on the sports deck... but they are more of a novelty than actual gym equipment because there is no tension. I am guessing this is because they aren't regularly monitored by staff, and kids can use them without adult supervision. The ship has two pools – the aft pool and the main pool (“Beach Pool”). Both of which are small which is to be expected on a cruise ship, but I found the main pool to be ridiculously small for the number of people it was to serve. While there is a lack of actual swimming pools, the hot tubs are in abundance – and that’s something that I normally complain about cruise ships lacking. While there were no hot tubs by the beach pool, there were two by the aft pool, two in Serenity, and four cantilever hot tubs on the Promenade deck…. That’s 8 hot tubs (not counting the ones I’m assuming were in the spa)! As for a children’s pool, there is none, but WaterWorks is quite a large area with kiddie slides and splash zones. Not to mention, there are also two really awesome waterslides – Twister and Drainpipe. Both are actually quite thrilling for cruise ship slides and because they don’t require inflatable tubes, the lines move fairly fast. The only thing keeping me from giving the Breeze a perfect score is the small size and location (not centered) of the beach pool. The Fun Times schedule was packed with activities, and every evening, Max and I would sit down with it and mark things that interested us. The sad thing was, after reading the Fun Times, we realized that there weren’t too many activities that appealed to us. While there was a different trivia game almost every hour (trivia is popular, too – get there early! ), I don’t think that “more trivia” is the answer to entertaining thousands of passengers. Much of the schedule was filled with events like “Free Seminar: Wrinkle Remedies,” or “Fashion Watch Sale,” or “Secrets to a Flatter Stomach.” I think they really need to start thinking outside of the box, or maybe just offering scheduled activities that aren’t complete sales pitches. While I found there to be a lack of organized activities onboard, we were never at a loss of things to do. 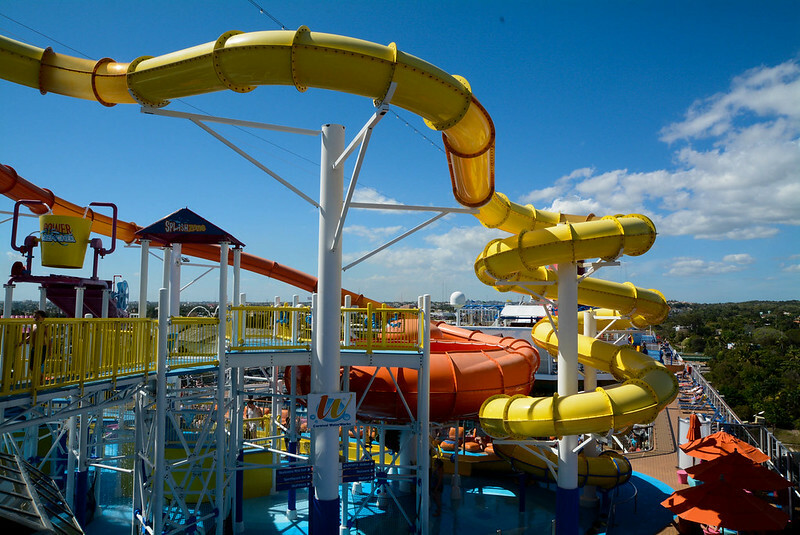 Carnival Breeze also had the typical cruise ship entertainment – hairy chest competition, belly flop contest, and other pool games. I was especially excited to discover that they played Quest (listed on Fun Times as “adult games”) which got much more rowdy and risqué on the Breeze than it did on Royal Princess, as Carnival actually enforced “adults only.” Carnival also had the Game of Love show which is the typical cruise ship version of The Newlywed Game that incorporates couples who are newlyweds, “middle of the road,” and the longest married. I have to say that Carnival’s Game of Love is my least favorite version of the show because they face the couples back-to-back and have them write on notepads, rather than taking the men backstage and interviewing the ladies and vice versa. I feel that it may be done this way because Carnival held their Game of Love at 3:00PM, rather than later in the evening, so they wanted to be able to sensor the contestants if necessary (or perhaps the other way around and make their responses more entertaining). During the cruise, I only saw one of the three stage shows offered, Motor City. The theme was very ordinary of cruise ship entertainment – a Motown-inspired stage show. There have been many complaints about Carnival’s new shows since the Funship 2.0 upgrades exchanged sets and props for an LED screen and dismissal of the Carnival Dancers, but I didn’t think that the new type of production was as bad as some have made it out to be. I liked that the entire cast (4 male, 4 female) was capable of singing and dancing. While the electronic screen which flashes colors and scenes in replace of backdrops is rather underwhelming and definitely removes value from the show, I found the costuming to be much improved. It’s definitely not Broadway-quality, and it’s just your average cruise ship entertainment, but I didn’t think it was unbearable entertainment. I believe that the disappointment arises because the entertainment quality on today’s newest ships has become exceptional, and Carnival’s attempt at keeping up with the competition through the 2.0 upgrades is laughable. Hasbro the Game Show is apparently quite popular on the Breeze, as there were three shows throughout the week. The idea is that you’re on the set of a live show, so you watch commercial breaks and set changes. Carnival Corp. seems to be trying to embrace the “live studio audience” concept with Princess Live! on Royal Princess and Hasbro the Game Show on the Carnival Breeze. However, I thought the theme of setting up a live show was poorly executed (perhaps also due to the setting in the theater), and at times it felt more like an awkward entertainment break and an excuse for them to let us watch them change sets. 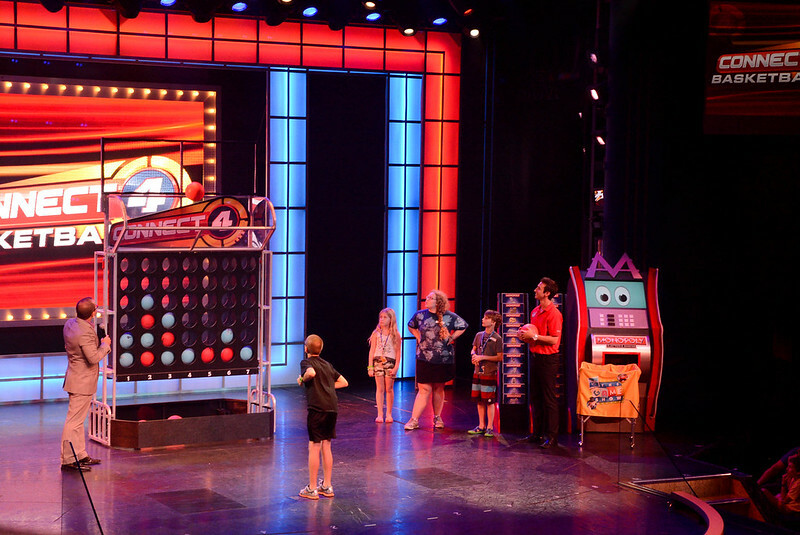 But unlike the stage shows, at least Hasbro the Game Show had moving sets. Hasbro the Game Show is essentially giant versions of classic board games. The games alternate with each show; we watched Connect 4 Basketball, Simon Flash (twice), and Yahtzee Bowling. To select members from the audience to play the games, they “qualified” by being chosen and getting a correct answer in Scattergories. The Game Show itself would have been much improved with a more enthusiastic cruise director. Sometimes I felt like the last place Pete wanted to be was surrounded by kids jumping at him, trying to be selected. The show was fairly entertaining to watch, and the kids all seemed very excited to play. I didn’t think that the actual games seemed like much fun and think that the novelty of playing a life-size board game was probably more appealing to a child than the game itself. Perhaps the most popular entertainment on the Breeze is the Punchliner Comedy Club (presented by George Lopez). The ship had two comedians who alternated shows for the first half of the cruise and then two new comedians for the second half. Due to the popularity, they clear the lounge after each show, and there is a long line to get in. Whenever we arrived, it was always standing room only. There really should be more seating or a larger venue. However, of all four comedians, I really only liked one of them. Perhaps I’m just not as eager to laugh when I’m standing for half an hour. When I sailed on the Breeze’s sister ship, Carnival Dream, I really disliked the layout of the Lido Buffet. So I rather expected to dislike the layout of the Breeze’s Lido Buffet, as well. My issue with the Lido Buffet is that there are food stations in the front (towards beach pool) and aft with the kitchen in the center. So it’s a long hallway from either side. This was actually an issue on Royal Princess, as well. I much prefer how Royal Caribbean sets their buffet up with ‘island’ stations so that they can be accessed on either side and don’t encourage one long line which you have to wait in to get the one thing that you want. I suppose this isn’t as convenient for the staff and is more difficult to transport food to and from. NCL had a good solution with the Epic by having the kitchen in the center and wrapping it all the way around with food stations. Despite my general dislike of the layout, I didn’t find the Lido Buffet as terrible on the Breeze as I did the Dream because I avoided at all costs visiting during peak hours. The buffet just doesn’t handle crowds well. I don’t have much commentary on the food because I am not a foodie, but I found it to be of decent quality. I should note that I really enjoyed the desserts (normally I am not a fan of cruise ship desserts because they are so rich) – especially the cookies and cake pops. Carnival seems to be reaching to celebrities to reinforce their brand, and they have added Guy’s Burger Joint to the Funship 2.0. The venue is outside on the pool deck, and the menu has four different burgers, as well as a “Plain Jane.” While the presentation is underwhelming (I’m not sure if Guy Fieri would have approved of the appearance of the burgers they were serving), they are of a higher standard of excellence and taste really good! Blue Iguana Cantina, opposite of Guy’s Burger Joint on the pool deck, serves burritos and tacos. I’m a big fan of Mexican/Southwestern cuisine, so I was excited that they had a station dedicated to serving tacos. It’s like a Moe’s in that you choose what goes on your burrito/taco. My only complaint is that the hours are limited. Fat Jimmy’s C-Side BBQ is open only on sea days and is quite popular (expect to wait at least ten minutes in line). 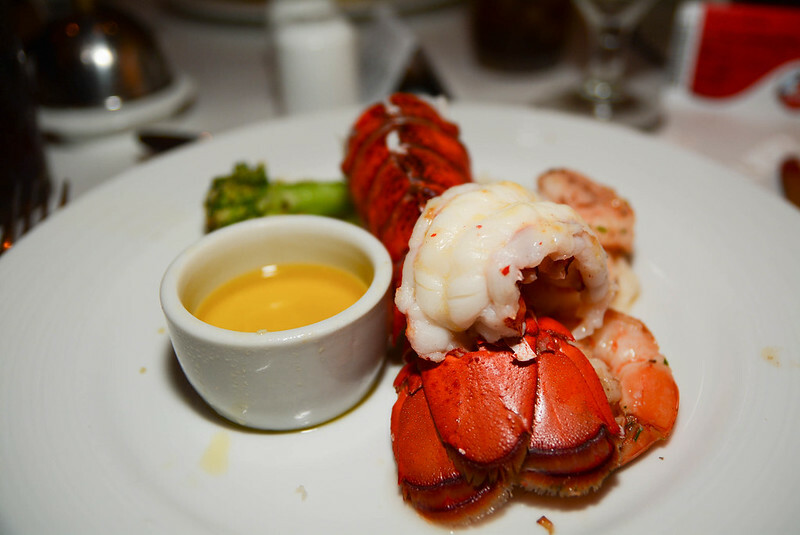 It’s located outside on the promenade deck and is well worth the wait. Max actually thought it might have been his favorite barbecue ever (I should note that Max is not a huge fan of barbecue). Bonsai is the for-charge (a la carte) sushi restaurant. The prices are around $4-6 per roll. I ordered the Bento Box which was beautifully presented, but not very good. Max ordered the Bonsai Triple E Roll and the Tempura Roll – both which he loved. The design of this venue is very clean and nice, but I cannot recommend what I ordered (I think maybe I made a bad menu choice… but it was under “Chef Specials”). We had the 8:15 PM seating in the Blush Dining Room and were shoved back in a corner, so we did not enjoy the atmosphere from our table. On the first two nights, the service was slow and terrible, but it picked up after that (due to many people not showing to dinner). We thought the food was very good. Almost every night, I found something on the menu that really interested me. There were only two nights on which I wasn’t fond of the menu. My favorite menu offering was actually the “Didja Ever” under appetizers. I didn’t really like the desserts except on a few nights. I usually found the chocolate to be too rich, and I don’t recommend ordering the healthy option because I did that once and it tasted like paper. I would say that Carnival’s dining room menu might have been my favorite on a cruise ship in a while. I’m a bit sad to hear that they are replacing it with the American Table menu, but I have high hopes that it will be even better. The Funship 2.0 upgrades have given Carnival two new characters – Red Frog and Blue Iguana. Both have “rival bars” on the pool deck, Red Frog Rum Bar and Blue Iguana Tequila Bar, and there are challenges between the two, and each has a deck party theme. In addition to the bar on the Lido deck, the Red Frog Pub has a really fun atmosphere. It’s tropically themed and has really fun specials such 101 oz beer tubes, fishbowls, and beer and liquor samplers. The pub also serves light snacks, but for a $3.33 charge. Red Frog Pub is a large venue with three rooms and outdoor seating, and a fun place to be during the day or evening. Piano Bar 88 is a popular evening hangout. The bar is actually tiled like piano keys, and the pianist sits behind the bar. I don’t quite agree with the set-up of the venue – the bar is wedged in the corner, and the seating goes along the wall. I think it would be better if the seating wrapped around the piano. Well, I thought that until I heard the pianist. He was *decent* on piano…. But his voice… was terrible. Make the ears bleed terrible. Not only that, but he hardly sang (which I suppose was for the best)… he spent most of the time ridiculing the audience members and just talking. He’d sing two lines of the song and then start talking. It was painful to listen to. I don’t know why anyone was sitting there listening to him or requesting songs. They had to have been really drunk to enjoy that music. Liquid Nightclub is a really fun venue with a good drink menu (well, the drinks are actually the same as Piano Bar 88’s, but named differently… almost the same menu). The club feels upscale and contemporary, and it functions well as a night club with plenty of room to dance and low lighting. I think that they could maybe add a bit more seating, but other than that, I think they did a nice job with the space. However, the DJ (DJ JonCarlos) was awful. Not only could he not mix music on the beat (isn’t that a requirement for a DJ? ), but he didn’t seem to understand when to play what music, and what music people liked to dance to. I really think he had absolutely no idea what he was doing, and I find it hard to believe that he has a passion for music. I really think they just pulled a random crew member maybe from the tech or entertainment staff and said, “Hey, you’re going to be a DJ.” DJing is definitely not his life calling, and I have no idea why Carnival would hire him. So even though the atmosphere was perfect for dancing, people just weren’t dancing because the music sucked. 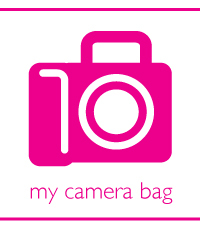 I have really high expectations of service wherever I go – whether a cruise, hotel, restaurant, or store. Overall, I would rate the service on our cruise to be relatively poor in comparison to service I have received in the past, on different cruise lines and on other Carnival ships. For the most part, I don’t think it had to do with bad crew members, but rather lack of an appropriate number of crew members to cover the jobs. Service on the first day really sucked all around the ship. The bars were understaffed. The dining room staff was stretched thin. No matter where we went – rather to a bar, the buffet, or dining room, we were waiting and waiting and waiting. As much as I want to say, “Oh, it’s just the first day and they’re still getting everything ready,” I think that’s a terrible excuse. The KNOW that the first day is always hectic, and they should have the staff prepared to handle it. The first day is important! It’s the first taste that passengers get of the ship, and the last thing they should want to do is make a bad first impression. While our service in the dining room did improve at dinner, I think it was more because we were the one of the only tables to consistently show to the dining room, so the staff began to focus their attention on us because they figured we would be the most likely to leave an additional tip. Whenever we ate in the dining room for breakfast or lunch, service was ridiculously slow, and it was clear that the wait staff did not care at all about what we thought of their service or the food. They were just doing this job because they had to. Our stateroom steward became more annoying as the cruise continued. He was always walking in on us after one quick knock and would rush us to leave for dinner so that he could go ahead and clean our room. And then when cleaning our room, he would make down the bed and take the room service tray... but he would leave empty glasses sitting on the vanity that we had clearly stacked up for him to take. We concluded that the only way to get him to take the glasses was to dump all of the contents into the sink and stack them on the room service tray. 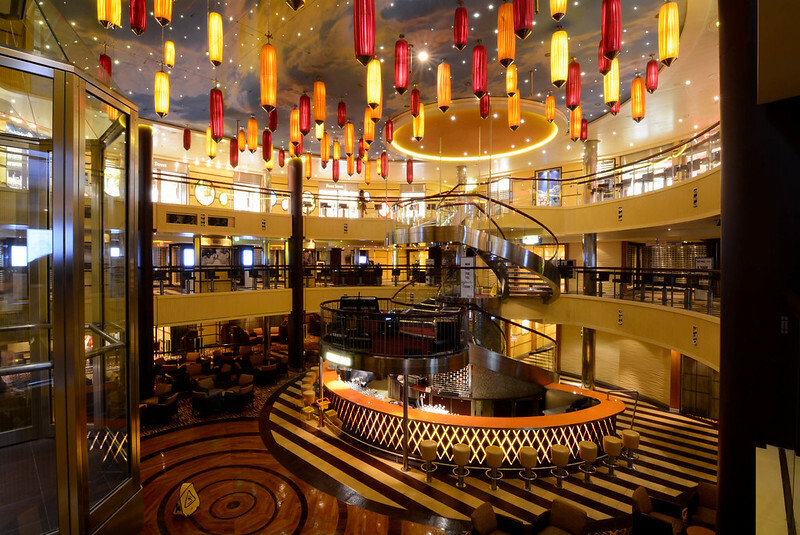 What’s unique about the Carnival Breeze is that it really takes a departure from the flashy décor that Carnival ships are known for. I’m sure many would say thank goodness, that’s a step in the right direction. However, I believe the Breeze is suffering from an identity crisis. One might think that the designer was striving for a tropical theme, with the Margaritaville-esque Red Frog Pub and thatch roofing on the main pool deck. 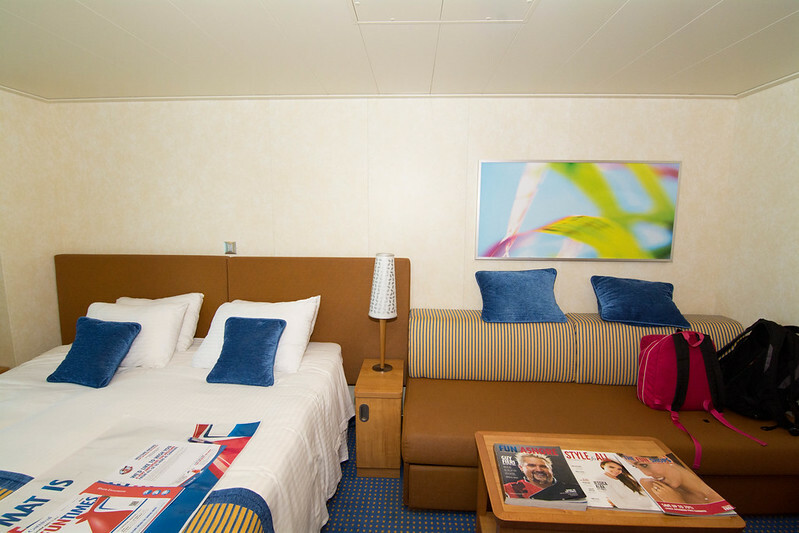 The hallways are decorated with photo murals of palm trees and wood finishes, and then the stateroom door swings open to reveal not a tropical oasis, but basic brown. 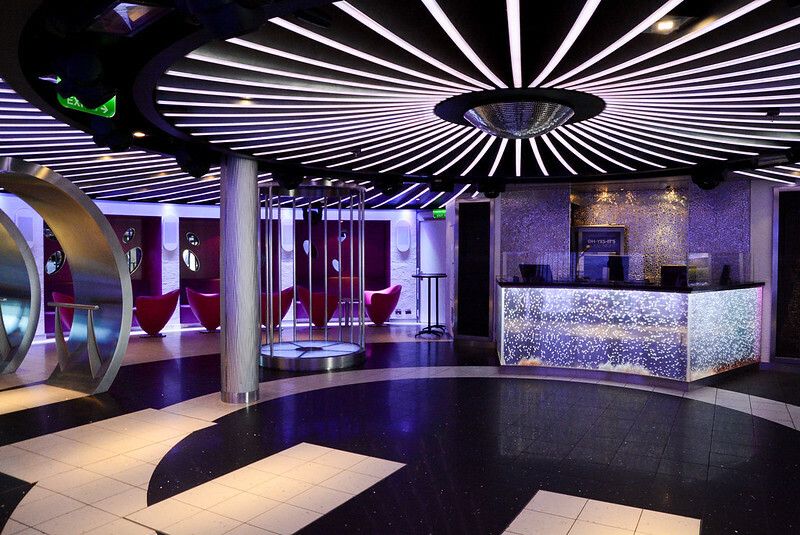 The promenade deck is a complete mixture of themes. There are clean, neutral spaces like Ocean Plaza. The piano bar is in-your-face, as the bar top is actually tiled like piano keys. On the pool deck and sports deck, the theme seems to be really bright colors, which is fun and suitable for an outdoor space. The atrium never quite did it for me while I was on the ship, but looking back at the long exposures I took on the last night, it’s actually not bad. I was never a fan of the mustard yellow paint, but the light features on the bar are quite nice. I believe that the root of this identity crisis throughout the ship was due to not understanding how to make more formal spaces continue the theme, or how to implement a transition from one theme to another. The spaces by themselves would function fine as individual components, but there was no continuity of design. Our cabin number was 2447 and classified as a Deluxe Ocean View (6M), “ideal for families.” The room was very spacious – more space than the two of us needed. The cabin has split bathrooms – with two showers! The main bathroom had a toilet, standard cruise ship shower with a curtain door, and a large vanity. The second bath had a small bathtub, as well as a sink. It was quite a luxury that each of us had our own bathroom and something that would be very helpful for families. The cabin also had an abundance of storage space. There were four closets, and between the two of us, we only used three (hanging space for each of us and shared the closet with shelves). The large vanity also had drawers and shelves, and there was even more storage in the nightstands and in the bathroom. I believe that this is the cleanest I have ever kept a stateroom, and I attribute that to the storage space. The room has a flat-screen television which is mounted on one side and pivots so that it may face the couch or the bed. The television is equipped with a menu which allows you to purchase shore excursions, check your onboard bill, and even order room service! There is no television-on-demand, but you can order movies-on-demand for $12 each (ridiculous, but we did buy one movie). While I really appreciated the size of the room, I was not a fan of the décor. Coming from the bright and tropical hallway, the room loses all Caribbean influences and moves into Pleathertown. The wood closets and vanity are actually quite lovely and look as if they belong in a room with a strong nautical theme. I actually think that the royal blue and gold colors used in the room are okay, but the brown pleather couch and pleather headboard is the ugliest décor I have seen on a new ship. There are also two pieces of artwork in the room that are photographs of plants taken on the micro scale…. Lime green and aqua blue. WHY are these pieces of art in the room? They don’t belong with the royal and gold or the brown pleather or the wood furniture. This room, much like the rest of the ship, is a hodgepodge of ideas that don’t relate. I had a wonderful time on the Carnival Breeze. One of my favorite things about Carnival is that they have more exotic itineraries than other mass-market cruise lines. That being said, I do think that the Breeze is lacking in areas of activities, entertainment, and service which many mass-market cruise lines are excelling in. It was really ironic that I received a free cabin promotion from Carnival, considering that at the end of my Royal Princess review when someone asked me about Carnival, I said that I didn't think I was going to be sailing Carnival again within the next few years because I was still really turned off by my Carnival Dream cruise over Christmas 2010. Everyone has their price, and a free cabin definitely sold me! I am glad that I tried Carnival again because the Breeze left me pleasantly surprised. I would sail Carnival again, but it is not at the top of my list. To be honest, Carnival is still my least favorite cruise line, in comparison to Royal Caribbean, Princess, and Norwegian (and soon again Disney - last DCL cruise was in 2000, so I don't feel like my opinion is currently up-to-date). I by no means had a bad time on Carnival or thought that it was a terrible cruise, but I think they're just at the bottom of the cruise industry when it comes to nice ships with unique features, high-quality entertainment, and service. Right now, there are newer ships and longer itineraries calling my name. If you're wondering about Max (who has now been on two cruises), he said that he prefers NCL over Carnival. 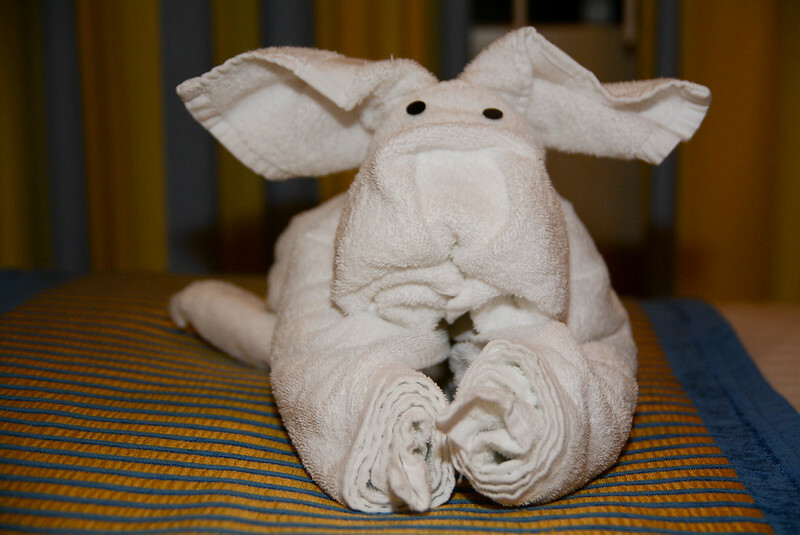 He felt like there was more to do on the Norwegian Epic and that service and entertainment was much better. However, he said that he much preferred Caribbean cruising to Mediterranean cruising. The color of my cruise card was red, and his was blue. He said a few times, "So next time my card will be red?" "Yes." "But hopefully that won't be too soon." Max will sail the Disney Fantasy 7-Day Western Caribbean itinerary in just two weeks, and Royal Caribbean's Oasis or Allure of the Seas is next on his list of ships to try.